The Dutch director Anton Corbijn is especially, if not uniquely, qualified to offer insight on the theme of the photographer and his or her subject. Before he began his motion-picture directing career with 2007’s “Control,” Corbijn was a meticulous and well-respected still photographer who shot some of the arts’ most enigmatic and intriguing figures, including Captain Beefheart, Bjork, Miles Davis, Robert De Niro, Peter Hammill, U2 (that’s Corbijn’s imagery on the group’s “The Joshua Tree” album), Gary Lucas, and many others. The aforementioned “Control” was a sensitive and bracingly unconventional account of the life of Ian Curtis, the Joy Division singer who was, among other things, a major inspiration to Corbijn. Corbijn’s “Life” is his fourth feature picture and in a sense his most ambitious, tackling the still highly mythologized and idolized 1950s film acting sensation James Dean, focusing on a few weeks before the 1955 film “East of Eden” premiered and made him into a particularly combustible superstar practically overnight. 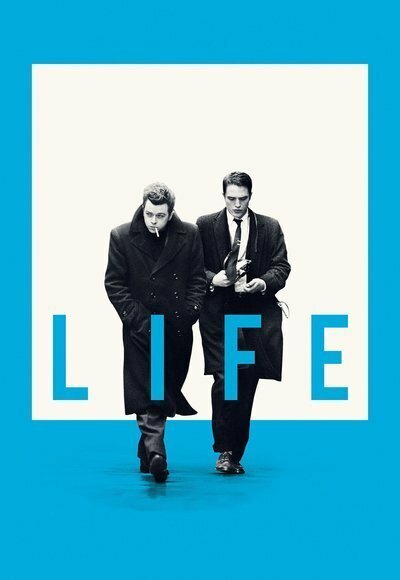 “Life” tells the story of Dean and Dennis Stock, an ambitious photographer working freelance for the late, lamented, large-format photocentric print magazine Life (hence the movie’s double-meaning title). The future icon is played by Dane DeHaan, while Stock is played by the bigger contemporary star Robert Pattinson. The two meet almost-cute at a Hollywood party at director Nicholas Ray’s house; Ray is considering Dean for a part in his next film, while Stock is looking for work away from the red carpet. Stock spots a t-shirted Dean trying to be invisible at the pool bar; the two start exchanging lines and for a good portion thereafter their exchanges look like a form of flirtation. What we really have, as it turns out, is two lost souls living in a fishbowl not of their making, and kind of wondering why they’re there, and how they’re gonna get out of it. DeHaan plays Dean as a kind of haunted smart-aleck, deigning to take nothing too seriously but generally regarding the world as a bully that’s taken away his puppy at the same time. In an interview promoting “East of Eden” he idly disparages a Western that later turns out to have been a big hit for the studio head Jack Warner (played as a courtly thug by Ben Kingsley), who subsequently advises Dean that if he wants a career he needs to begin behaving in a more “intelligent” fashion. Stock, meanwhile, makes okay money working with fellows he calls the “red carpet gorillas,” but wants to make art of his own, and sees Dean as the ideal subject for a photo essay. And so the two form an uneasy alliance, trekking to New York and then to Dean’s home in Indiana to capture some unstaged moments in … life. Corbijn, as has been his custom in directing features, goes for mood and feel rather than narrative momentum, although his scope is clearly hemmed-in by the production’s budget; there’s not much here in the way of effective ‘50s-New-York evocation. But the actors and their exchanges ring true, and by the time the film reaches its lonesome conclusion, the resonances are eerie. Dean will go on to become a legend, almost literally, given that his next two films, “Rebel Without A Cause” and “Giant,” both American cinematic monuments, were released posthumously. And Stock will live a long and successful life as a photographer, his stills of Dean giving us what would turn out to be rare glimpses into the person behind the screen icon. Life can be awfully odd sometimes.